On Friday one of our jobs was to take off the upper portion of the water tower using the overhead lift in the shop. We then hooked up the mine car to lift it up on the rails. I cross braced and welded it all to make it extra sturdy. There is no chance it will ever move again. 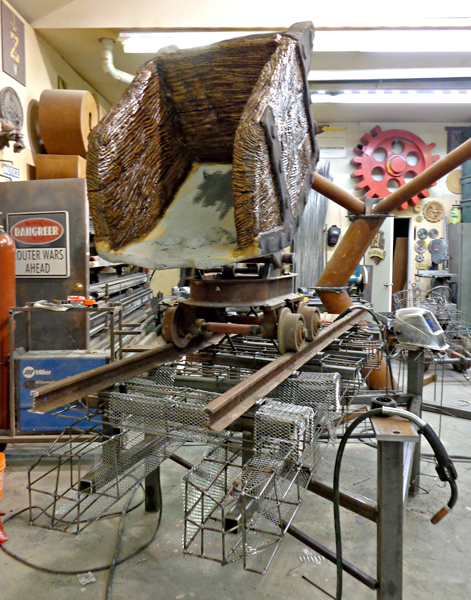 We then welded the armature for the rail road ties and beams to 'hold' it all up visually. The crew will finish attaching the lath to the framework this week and then we can begin the sculpt with our fiberglass reinforced concrete. By the end of the week this whole section should be ready for paint. The water tower portion of the feature won't be far behind.